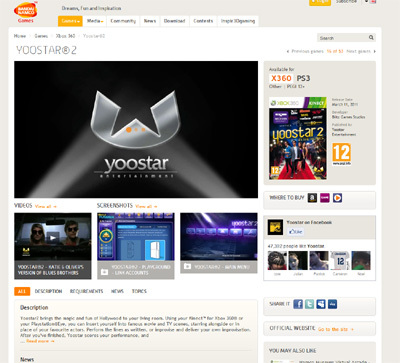 Yoostar 2 really does bring the hectic world of Hollywood into your living room and is now available for the Xbox Kinect and the Playstation Move. I have to say after about an hour of playing this game I switched it off as I was so bored it was unreal. I found the game to be very unimaginative and boring hence the rating I have given it. We have also compiled a Review System for this, of which Yoostar 2 is Rated as Two Stars, the second lowest possible score available from the Game Review Team.